With Oracle CX Cloud, companies not only get the most comprehensive CX offering, but also an innovative and powerful cloud platform to extend, analyze and integrate these applications with the rest of the enterprise resources, as well as to optimize them for every user. This session outlines the Cloud Platform (PaaS & IaaS) solutions that Oracle provides to streamline cloud development and empowers you to deliver enterprise-grade solutions rapidly and cost effectively. Join this event if you are interested in the most advanced way to extend, analyze and integrate the Oracle CX solutions. In subsequent webinars, we will drive you through further Integration Solutions’ details. For details please visit our registration page here! In the digital economy, integration is no longer a technology term—it’s a business imperative. After all, when your business strategy depends on how quickly you can analyze and act upon data, building a clear and consistent flow of information is more than just a lifestyle choice. But it’s not simple. Information must move across myriad applications from mobile and cloud-based apps to on-premises systems. Add in factors like the explosive growth of the Internet of Things (Gartner predicts 30 billion devices by 2020), and it’s pretty safe to assume that integration requirements are only going to get more complex. Die IT eines Unternehmens wächst mit dessen Bedürfnissen, nicht nach einem Masterplan. Klar, dass dann irgendwann jeder Unternehmensbereich mit eigenen, speziellen Anwendungen arbeitet – von lokalen Business-Applikationen bis zur SaaS-Lösung in der Cloud. Probleme entstehen dann, wenn der Austausch zwischen all den Systemen nicht reibungslos läuft: das kostet unnötig Zeit, Nerven und Geld. Viele Firmen nutzen bereits Integrationsplattformen als Schnittstellen zwischen einzelnen Systemen. Aber kann eine solche verzweigte Integrationslandschaft in Sachen Datenvolumen und Dynamik mit den neusten Entwicklungen mithalten? Wie Sie sich den Überblick zurückholen, ihre Prozesse optimieren und bei der Integration wieder auf eigenen Beinen stehen können – darüber informiert Opitz Consulting ganz aktuell unter http://www.auf-eigenen-beinen.de. Neben einem Überblick zu möglichen cloud-basierten Integrationslösungen, zum Beispiel zur Oracle SOA-Suite, haben Sie dort auch die Möglichkeit, einen individuellen Beratungstermin mit den Integrations-Experten von Opitz zu vereinbaren. Ein kleiner Schritt für Ihre IT-Fachleute – vielleicht aber ein großer für Ihr Unternehmen! You are an Oracle partner and also want to run a joint campaign? Get more details here. Fachbereiche bringen mit neuen Cloud-Lösungen (SaaS, PaaS) schnell innovative Produkte und Dienstleistungen auf den Markt. Es entstehen dabei vielfach neue Insellösungen (Silos). Stellen Sie sich die Frage, wie Sie die Insellösungen einfach und sicher wieder in Ihre IT-Unternehmensprozesse integrieren können? Jedes zweite Unternehmen hat in den letzten drei Jahren Cloud-Lösungen (SaaS, PaaS) wieder aufgegeben, weil die Integration nicht funktionierte. Mit den iPaaS-Lösungen (Integration-Platform-as-a-Service), wie zum Beispiel von Oracle werden Cloud- und On-Premise-Anwendungen vernetzt, in Ihre ITUnternehmensprozesse integriert – keine Silos mehr! Nutzen Sie die Chance – gewinnen Sie ein Cloud Services Integration Bootcamp mit ipt. Als Schweizer Integrationsexperte bietet ipt Ihnen einen halbtägigen Workshop an. In dem Bootcamp erarbeiten wir mit Ihnen die Grundlagen, damit Sie weiterhin den Fachbereichen Ihres Unternehmens nachhaltige Innovationen in der Cloud ermöglichen – schnell und sicher. Versuchen Sie ihr Glück noch heute – gehen Sie auf www.cloud-integration.ch und machen mit beim Wettbewerb! With the launch of the Oracle Cloud PaaS Platforms we will make the SOA & BPM Partner Community cloud ready. In this article series we will lay the foundation for cloud computing including definition and concepts. Why is everyone talking about cloud computing? Drawn-out, expensive IT projects that are planned and implemented with few benefits for the business stakeholders are commonplace. In contrast, cloud computing offers business users the chance to immediately implement services with usage-based billing that are tailored to their requirements, often without the need to consult with the IT department. However, aspects including security, architecture, availability, and standards are often not evaluated. Cloud consumers find themselves at the mercy of the cloud provider. Scenarios that require changing cloud providers after a cloud provider goes bankrupt, and the associated moving of data and/or applications, have not yet been sufficiently tested. Business continuity should play a key role from the start of a cloud evaluation process. One of the greatest challenges here is the integration of existing data and systems into the cloud solution. Without integration spanning clouds and on premise systems, processes can only be executed in isolation, leading to cloud-specific silos of isolated solutions. Important information for users is not available across processes and systems. Problems that would have occurred in the company’s internal IT are now shifted to the cloud provider. To prevent "legacy clouds" or solutions that are hard to maintain, it is important to manage the entire architecture proactively and, in particular, the integration into the cloud. Even if cloud providers want us to believe otherwise, not every aspect of IT can be outsourced to cloud solutions! 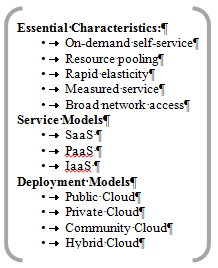 In deployment models, distinctions are made according to availability and installation location. Public clouds are services that are available to the public on the Internet. Private clouds are internal company services. Hybrid clouds and community clouds represent mixtures of these models, such as when Amazon computing power is used in the event of a failure or overload of an internal company cloud application. Large companies for which IT plays a central role or represents a competitive advantage often build internal company cloud solutions in their own data centers “private clouds”. Small and medium enterprises frequently use public cloud services. A further distinguishing feature is the cloud consumer focus. 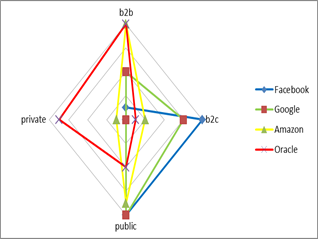 In the business-to-business segment, private clouds are predominantly used, while in the business-to-consumer segment the majority are public clouds (Figure: 1). Wikipedia defined cloud computing more from a consumer perspective. The article highlights that cloud computing is often used as a jargon term without a commonly accepted non-ambiguous scientific or technical definition.*3. From my perspective the NIST definition is widely accepted between b2b vendors. Many software vendors try to brand their solutions as cloud solution, or cloud enabled solutions without to respect the NIST cloud definition. This reflects the change of the IT industry caused by cloud computing. Provides value added services on top of a cloud platform. An example is the Force identity service from Salesforce. This identity service can be used to identify users across several cloud services. 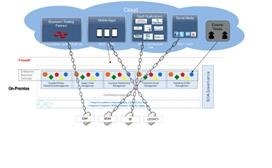 Ensures the interoperability between different cloud services. An example is Boomi from Dell. The service let cloud consumers integrate for example a Salesforce CRM system with a Netleger billing system and or an on premise solution. As IT System are often historical grown and rally build on a green field approach cloud aggregation becomes key for cloud adoption. A cloud service arbitrage provides flexibility and an “opportunistic choices” by offering multiple similar services to select from. *5 Heroku for example lets the cloud consumer choose between different cloud services. The cloud consumer might increase service level agreements or reduce the dependency from one cloud provider by a service arbitration service. Large leading cloud providers e.g. Google or Salesforce try to offer comprehensive services & platforms for cloud consumers. Often they are not interested to enable cloud broker services which might enable cloud consumer to choose or broker between different cloud providers. Sometimes their strategy can be characterized as a vendor log-in. Today no industry wide standard for cloud brokers is developed. To enable seamless service aggregation on a process level, between different cloud providers a meta-data model between them needs to be established. This model needs to include joint business objects and services to ensure seamless processes across multiple cloud providers. Simplify cloud integration with a unified and comprehensive solution to integrate disparate cloud and on-premise applications. Oracle cloud integration leverages Oracle Cloud services as well as components from Oracle’s SOA, BPM, and data integration technologies. 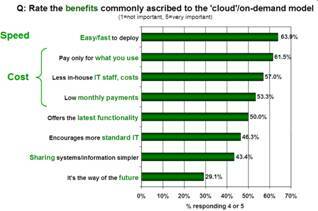 Why is everyone talking about cloud computing? Drawn-out, expensive IT projects that are planned and implemented without any benefits for the business stakeholders are commonplace. In contrast, cloud computing offers business users the chance to immediately implement services with usage-based billing that are tailored to their requirements, often without the need to consult with the IT department. However, aspects like security, architecture, availability, and standards are often not evaluated. 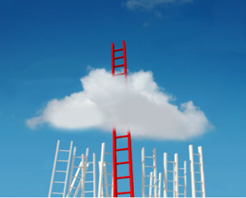 Cloud consumers find themselves at the mercy of the cloud provider. Scenarios that require changing cloud providers after a cloud provider goes bankrupt, and the associated moving of data and/or applications, have not yet been sufficiently tested. Business continuity should play a key role from the start of a cloud evaluation process. One of the greatest challenges here is the integration of existing data and systems into the cloud solution. Without integration spanning between clouds and on-premise systems, processes can only be executed in isolation, leading to cloud-specific silos of isolated solutions. Important information for users is not available across processes and systems. Problems that would have occurred in the company’s internal IT are now shifted to the cloud provider. To prevent "legacy clouds" or solutions that are hard to maintain, it is important to manage the entire architecture proactively and, in particular, the integration into the cloud. Even if cloud providers want us to believe otherwise, not every aspect of IT can be outsourced to cloud solutions! Share your comments and feedback on the Industrial SOA series by using the hashtag #industrialSOA. 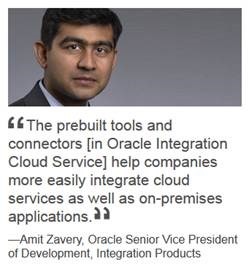 Read the full article at the Service Technology Magazine or Oracle Technology Network. Missed an article of the Industrial SOA series visit the overview at OTN.